Cranford High School put on a spectacular spring musical on March 8 through March 10, Hello Dolly! Nine staff members oversaw 45 students in the cast and more than 60 students involved in the play. Well over 1200 people came out to see the show. A congratulations is in order for all the terrific participants who contributed to making this musical extremely successful and fun. On March 14, the Sefciks family came to give a presentation to the 10 and 11th grade students during an assembly and 6th through 12th grade parents in the evening. The assembly provided students, parents and educators a view of what teen depression can look like. Their story empowers teens to look to others (friends, teachers, trusted adults) for help and support. Mr. Vito had a guest speaker in his AP Government class. Special Agent Steve Mulcahy came and spoke with the class on his role as an FBI agent. On February 12 CHS held an assembly for all 10th and 11th graders. The assembly provides students, parents and educators a view of what teen depression can look like. The program, called Remembering T.J., empowers teens to look to others (friends, teachers, trusted adults) for help and support. It educates them to pay attention to their mental health and emotions, something that is often pushed to the side. They describe many of the red flags often dismissed as typical teenage behavior. Their story gives hope to teens who may be struggling and are unaware of what to do with how they are feeling. CHS held our second Club Fair for the year. Students went and explored all the clubs offered for them to join and participate in. On January 25th and February 1, the PE Drivers Ed class had a guest speaker, Dave Schlossberg, who gave a presentation to the students about the effects of drinking and driving through his own personal experience. Dave was paralyzed by a drunk driver 14 years ago and now travels to high schools sharing his experiences, inspiring students to persevere through challenging times. Mr. Vito’s Criminal Justice class welcomed Detective Nazzaro as their guest speaker to discuss the role of police officers in today’s society. He helped the students get a better understanding of what their role is in connection to the law and enforcement. On February 15, the International Thespian Society students hosted an 80’s prom theme murder mystery dinner fundraiser at the high school. This helped support the acting and tech theatre students. Congratulations to Nora Sullivan who represented CHS in the poetry out loud regional competition on February 20. Nora was one of ten finalists from Union and Essex Counties. The Japanese club held its first “bunkasai”, Japanese Cultural Festival, on February 22. Japanese cuisine was served with lots of games pertaining to the Japanese cultural. Congratulations to Blathnaid Iosso on being selected for the 2019 Unsung heroes Award! Blathnaid met the criteria of what the Unsung hero award recognizes. She is a student who has distinguished herself in a unique way, who models good citizenship, and has a quiet strength that inspires others. A recognition award has been presented to her from the Union County Boards Association on March 13, 2019. Bridget Dineen is the first place winner of the New Jersey Daughters of the American Revolution (NJDAR) Good Citizen Award contest. Not only is this an honor for Cranford High School, but also for the Crane's Ford Chapter of the DAR. Bridget competed in the essay contest along with other students from across the state. This is an annual contest that goes back many years, and it is the first time that Cranford High School has a first place Good Citizen winner. Bridget will be recognized and receive her award at the NJDAR annual awards banquet later this month. Her essay also won the Regional Competition and is 1 of 8 essays to move on to the National Competition. Congratulations to the Cranford High School students who placed in the top six of their events at the New Jersey DECA State Career Development Conference which was held from March 4 - 6. in Atlantic City, NJ. This accomplishment allows them to compete at the 2019 DECA International Career Development Conference in Orlando, Florida this April. Forty-five students were sent to this conference to compete against more than 5,000 students representing 108 schools from across NJ. Also earning an invitation to the International DECA Leadership Conference are Grace Power and William Johnson for winning the Open Event/Video Challenge. In this event, teams were given the challenge of creating a one-minute promotional video for DECA. We are proud to say that Cranford’s team took the top spot from a field of 28 schools and was shown to the entire assembly of students during the Grand Award Ceremony. Advisor Mrs. Donna Cathcart was also recognized for 20 years of service to Cranford High School DECA. One of our schools 9th grade students, Catarina Guimaraes, has a self-published Novel called Black Rose that is currently selling on amazon. Congratulations on such a great accomplishment. Several students in the fine arts classes attended the Guggenheim Museum in New York City on a class trip on March 5. They had the chance to view the Paintings of Hilma af Klint; paintings for the future, on view in this exhibition of work from the long-under recognized innovator of abstract art. 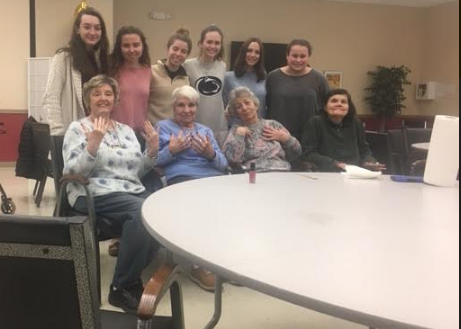 The Glamour Gals National Organization paid a visit to the Senior Citizens Housing in Cranford and provided residents with makeovers and manicures. Residents were happy to see and engage with the young women. The afternoon ended with a promise to return in April. 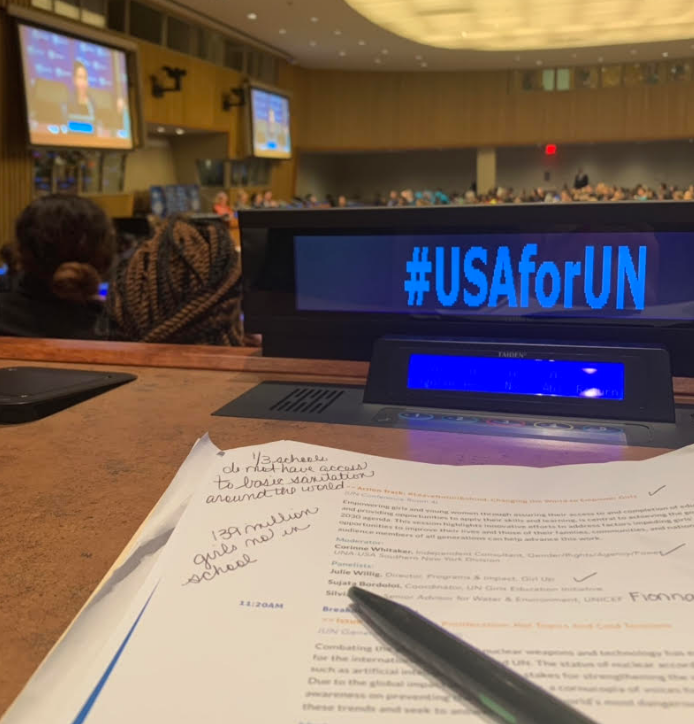 The students who represented Cranford High School at the United Nations Association USA Global Engagement Summit had an amazing experience. The Summit was located in the General Assembly Hall where the students sat where world leaders meet to discuss international policy and decide on programs of the UN. 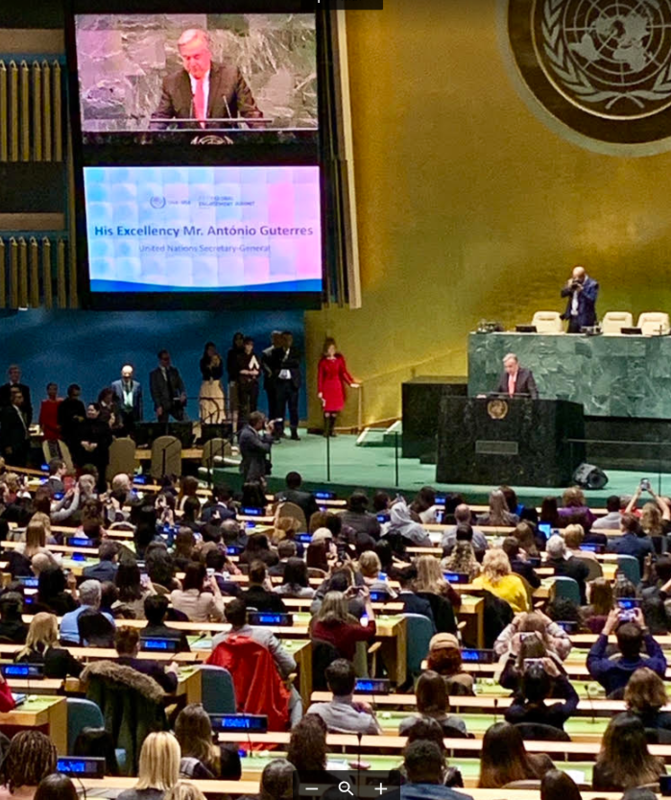 Julia Vaughn, Scott Weichert, Kayla Hooey, Lily Gudoski, Megan Robertson, Alexis Santoro, Gabriella Moreno, Mason Towery, Mallory Fries, and Emma Scott learned about the work of the UN and there were able to hear Secretary General, His Excellency Antonio Guterres of Portugal give the opening remarks. The Union County Student Training and Enrichment Program is a day-long summit that invites high school sophomores and juniors from throughout Union County to participate in hands-on activities focused on leadership, personal growth, and civic engagement. Juniors Erin Lynskey and Izabella Pinto were honored by the Union County Freeholders for their winning team's project for Suicide Prevention. The CHS Student Council will be participating in this project later this school year. Please congratulate Maggie O’Donnell for being the Union County Champion in the girls 100 yard butterfly at the Union County Swimming Championships held at Rutgers University on January 21st. She also took 2nd in the 200 yard freestyle. Furthermore, Maggie broke a school record previously set by Julie Byrne in the 200 free. On November 28th, 11 Latin students participated in the National Classical Etymology Exam (Greek and Latin Roots exam). Congratulations to the two medal winners: Grace Wilson, Gold Medal and Ryan Rosenthal, Bronze Medal. The CHS acting students performed in The Winter Drama Showcase on January 17th. As with every year, our "Theatre in the Raw" production features the Elements of Acting students performing improvised scenes, and the Academy Actors performing select pieces from the STANJ competition. Cameron Matheson has been cast in The Education Series performance of Taming of the Shrew at the Algonquin Arts Theatre in Manasquan. The Model UN club threw a Formal Event at the end of their meeting year, to celebrate all of the hard work our delegates have put in for the year. Advisors Linda Cortinas and Richard Bell were amazed at the energy and effort the officers put into decorating the larger cafeteria to become our Luau under the Lights. Lights strung between pillars, leis and Hawaiian shirts on the delegates, and luau music playing on the speakers; the officers created a whole new feel for the cafeteria. The officers also created awards to give out to recognize unique efforts of the other delegates, and we recognized our 4th year seniors with 3D printed duck awards to commemorate their time in MUN. The leadership gavel was passed down from this year's president Emma DeBole to next year's president Paul DeBole, along with all of the wisdom of leading this 125 student group this year. This student led event was a great success! Congratulations to Andrew Gagliardo who was awarded the NJGSCA North 2 Region Coach of the Year. Mrs. Nicole Savino Mulcahy has been selected as one of the five recipients for the “Excellence in Education Award” to be presented during this years CTAUN conference at UN headquarters. This award is for Mrs. Savino Mulcahy’s Global Affairs Cohort which they felt was one in which teachers, student teachers and attendees will be very much interested in hearing about. Congratulations! On January 31st, the Youth PAL Wrestling Program, run by Kevin Murray, had a big match against Woodbridge (both teams undefeated). After reaching out to Pat Gorman, The high school wrestling team showed up for the match to support the PAL team. The high school team was helpful, polite and supportive of the PAL team. This dedication and support of the community is what helps make Cranford great. Hats off to coach Gorman for running a great program. A big thank you to Mr. Torsone, Athletic Director, who is always willing to do whatever it takes to make the youth program successful. The PAL team ended up winning the match with a score of 40-36. Congratulations to Christopher Saba for being nominated CHS Spotlight Teacher of the Month for February. On February 6th we celebrated Michelle Balsario for being Teacher of the Year with a luncheon in her honor! In addition, important information can be found on the right navigation as well as below. I encourage you to take a few moments to review the following documents, and please feel free to contact me with any questions you may have. These forms are optional and should only be returned if you choose to apply. Hard copies will also be available in the main office. Please take some time to review our entire website at your convenience as it is has a wealth of information. All students are assigned a locker with a combination lock to secure their school supplies. Due to security reasons, only school issued locks may be used on lockers and this lock should be kept throughout high school and returned upon graduation. Students are expected to keep the lockers neat and clean. Students will be responsible for damages and may be assessed the cost of repair. Any damages to lockers should be reported immediately. Loss of a lock will result in a five dollar replacement fee. 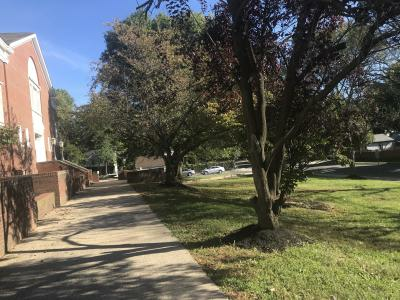 Cranford High School has security cameras inside the building and around the perimeter of our school to ensure the safety of all staff, students, and visitors and to safeguard our facility from vandalism and theft. Cameras will be used in locations as deemed appropriate by the administration. Video recordings will be reviewed if there is evidence that a violation of board policies, administrative regulations, building rules, or laws has occurred.